Don’t you wish we could just write a letter to Tom Skilling and have him transform this into proper sweater weather? Sigh. I could not agree with you more! I was so mad that I had to turn on the air. I hate air conditioning and have had it in use way too much this summer. Oh- it’s fall, right? When can I break out the sweaters? Be thankful you’re not in Texas, that is all I have to say. I’m sick and tired of the heat. It is supposed to be chilly in October, how can one get into the Autumn spirit when it feels like summer still? I covet your 87 degrees. Berkeley is way hot for October as well. But in the evening a nice, brisk, fall wind kicked up and we do have dead leaves everywhere, so it’s fall-like enough. I love your legs shot, It reminds me of the wicked witch of the east (west?) crushed under Dorothy’s house, hehe. Ick! That kind of heat definitely is NOT fair. Especially since you are also guaranteed a frigid winter! Love the feet — can’t wait to see the rest of your next little creation. shoes! i sense a potential cutie-pie on the horizon…..
Just love those cute shoes. Looking forward to seeing her. Hmmm… maybe you should be cranky more often. 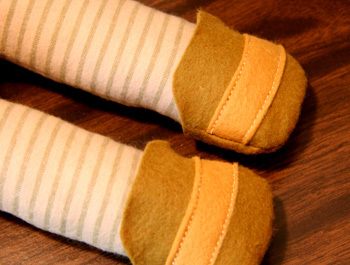 Those shoes (and presumed softie attached) are so darn cute! I’m in Arizona. I feel your pain with the heat.